Charley Thompson (Charlie Plummer) has just moved to Portland, Oregon. 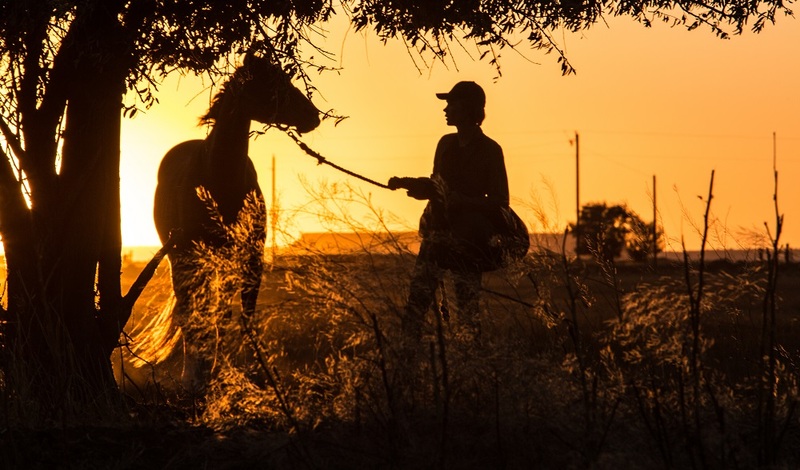 The 15-year-old spends his summertime mornings running the streets surrounding the local horse racing track in order to stay in shape for the upcoming high school football season. His lovably affable father Ray (Travis Fimmel), more big, dopey brother than he is a protective parent, is a little down on his luck, holding down consistent employment not his forte. So when Charlie literally runs into Del (Steve Buscemi), a horse trainer in desperate need of assistance due to a bum hand, after helping him out the teenager just up and asks for a job. Next thing the kid knows he’s helping clean out stables, washing horse trailers and making friends with Del’s current stock. With no prior familiarity with horses, to Charlie’s surprise he ends up becoming infatuated with a Quarter Horse named Lean on Pete. The pair bond immediately, their walks around the track’s training areas a daily delight. But as eye-opening as trips to county fairs and horse racing tracks throughout Oregon and Washington might be, Charlie can’t help but think Del’s treatment of Pete, his constant usage of him in race after race with almost zero rest, will destroy the horse sooner rather than later, the emotional toll almost more than he can bear. 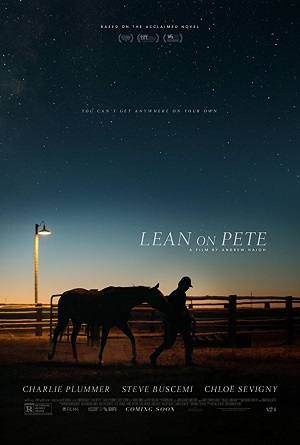 Based on the book by author Willy Vlautin, 45 Years and Weekend writer/director Andrew Haigh returns with the devastatingly evocative and hauntingly emotional Lean on Pete, a mesmerizingly austere drama filled with sincere truths that are frequently startling. What starts as a self-contained coming of age character study quickly blossoms into an impromptu road trip that that will take Charlie across the western United States, almost all of it on foot and with Pete sauntering slowly behind him. 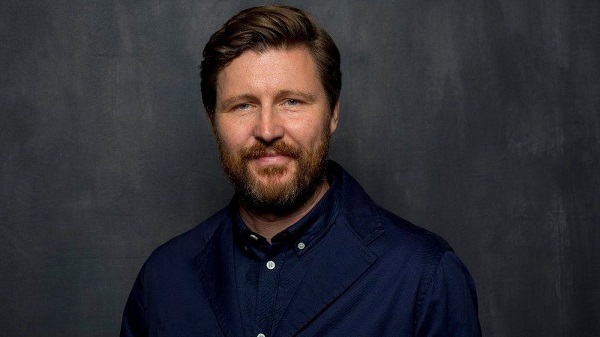 While the reasons for his leaving are better left unsaid so as not to spoil any surprises, Haigh grounds things with a deft precision that makes the teen’s decision to head out on his journey, no matter how foolhardy it might be, come from a place of authentically realized truth that’s heart-wrenching. There’s just so much to love. I felt like I was living inside this Pacific Northwest world Haig had manufactured. I knew these people. I’d been to these places. I’d eaten an Elephant Ear and have jogged along the unknown back roads of the city I lived in marveling just how close the quiet countryside and the noisy cacophony of an urban downtown core could somehow coexist. I could relate to what it was Charlie and Ray were dealing with, and while my family’s money troubles were never as overtly critical as theirs prove to be, I can still understand the oceanic expanse of the emotions they were swimming through as each tried their best to do the right thing for the other. Once Charlie does start his long trek with Pete I found it impossible not to urge him forward even if he was making a huge mistake stepping out that door. From that point forward there is an observational poetic resonance that I couldn’t resist. Charlie has a number of individual encounters, all of them opening up additional themes for Haigh to explore. The nature of these vignettes are varied, each spotlighting an element of the human condition that’s as familiar as it is complicated. It’s memorable stuff, Charlie’s understanding of each situation changing and becoming more nuanced and complex as he attempts to get to his ultimate destination. Plummer is in virtually every scene and the young proves to be more than up to the challenge. The King Jack and The Dinner actor delivers an extraordinarily complex performance, traveling through an emotional maelstrom with astonishing clarity. He has a scene in a hospital talking with the doctor who had been treating his father that had me clutching my armrests, the expressiveness of Plummer’s reactions crushing. Later on, he has a moment with a young woman he meets on his travels that had me holding back different kind of tears, the level of kindness and compassion flowing out of the actor as the two conversed and connected while washing dishes simply sublime. Haigh manages to get the best out of his supporting cast as well. Not just out of the familiar faces like Buscemi, Fimmel, Amy Seimetz, Steve Zahn or Chloë Sevigny, but also out of the mass of newcomers who comprise the majority of the people Charlie comes across during his trek. Whether movie star, veteran character actor or unrecognizable novice, all feel entirely suited to the respective role they are playing, allowing the film to achieve another level of authentic resonance that significantly augments the emotional components that drive the plot onward. Best of the bunch might be Alison Elliott, her character’s brief speech to Charlie near the end of the story carrying the same sort of hypnotic empathetic grace that Michael Stuhlbarg’s deservedly lauded climactic monologue in Call Me by Your Name brought to that critically acclaimed Academy Award winner. Beautifully shot with a stark sensitivity by cinematographer Magnus Nordenhof Jønck (A War), Lean on Pete achieves a visual elegance that grows more expansive and expressive as it goes along. As lovely as it all looks, however, Haigh never loses sight that this is Charlie’s story and his story alone. Even sudden plot turns that, unless they are familiar with Vlautin’s source material, will catch almost every member of the audience by surprise only exist to add to the teenager’s tale in ways that are effectively genuine. The bitter truths of life’s regrets and hardships are all ones Charlie gets to look upon with a forceful clarity that is rare for a teenager to experience, his ability to persevere and still cling onto the aspirational hopes and dreams of a future adulthood that’s right around the corner unforgettably inspiring.